Power Pack gives you a larger server for a smaller price. Power Pack lets your server handle regular load and steps in only when things get busy. Up to double your server power (RAM & CPU) on demand. Unlimited bandwidth for the busiest of times (available in most locations). Server Density Monitoring with real-time alerts to monitor your server load and resources. Designed to deal with unforeseen peaks in demand, Power Pack scales automatically so you’re covered at any time. Our cloud is designed to be reliable by eliminating single points of failure, so when there’s a hardware failure your services continue uninterrupted. We take downtime seriously. So seriously that outages for our cloud services are credited at ten times the prorated rental for the affected service. We strive to provide reliable hosting with performance backed by our SLA. If we fail to achieve 99.9% availability for SSD VPS servers in any monthly period, we’ll credit your account with the affected portion of your monthly bill. Like so many things in business, when it comes to data centers, location matters. We offer servers located near your users, enable faster response times, quicker throughput and provide a local presence. With 24 global data centers across 5 continents, you can choose the best locations for your users (Please note that not all services are available in all locations). Enjoy the freedom to choose from a variety of operating systems, including CentOS, Ubuntu and Windows, with a number of different pre-built configurations ready for your server. Server Monitoring and Monitoring + Configuration. At VPS.net we offer two types of managed services solutions: Server Monitoring and Monitoring + Configuration. These services are ideal for customers who wish to maintain a hands-off approach. Would you like us to help you configure your server ? Let us know the requirements and we’ll take over for you. Our friendly and helpful in-house expertise is available 24/7/365. Update or modify virtual servers with script injection. Update or modify hypervisor zones with script injection. Post provision installation scripts for third party uses. Don’t be nickeled and dimed. With VPS.NET, security isn’t extra, it’s guaranteed. Other hosting companies may charge for SSL certificates, but at VPS.NET we believe that security is a top priority that should be available at no cost to clients. Improve your SEO rankings and build a reputation of confidential reliability while knowing that your information will be kept under lock and key. Have a question at three o’clock in the morning? No problem. Our expert 24x7x365 support team has you covered. Whether you have a problem to solve or simply need some advice, we’re here to help by email, chat and phone 24 hours a day, 7 days a week, 365 days a year. Easily create and deploy a copy of your server, either within the same cloud or to a cloud in another location with our Clone and Migrate feature. We fully support migration from SSD-VPS and Cloud Sites to Cloud Servers. So as your service gets traction and traffic increases, you can deliver using the full power of our cloud. Our cloud is designed to be reliable by eliminating single points of failure to safeguard your server against downtime. Multiple servers work together to power your site, so if one server fails, it’s simply removed from the cloud and your service continues unaffected. Be prepared for unexpected changes in demand for your services. Auto-scaling instantly adds resources to your server as demand increases, so you only pay for resources when they’re needed. And, you can set your own limits, so you remain in control of your costs. Alternatively, add Power Pack to your server for a simple low cost auto-scaling solution with resources included. Easily add and remove resources to your cloud server without the need for downtime or reboot. Prepare for fluctuations in demand, seasonal changes and projects by scaling up and down as required without interrupting your service. Super fast, highly reliable, local RAID, Solid State Disks operate at up to 100,000 iOPS to ensure that your applications run quickly and data is served to your users at lightning speed. For our Cloud VPS storage solutions, we’ve prioritized reliability, flexibility and fast restore. Our Enterprise Grade disks (e.g. HP) are configured in a RAID 10 Storage Area Network (SAN). We use redundant disks, power supplies and Active-Active controllers to ensure high availability. Our API is powerful and feature-filled to make services more efficient. Automate operational tasks like creating, resizing and rebooting cloud servers. When you connect with VPS.NET Cloud VPS, you unleash a full API which allows you to create, manage and resell cloud servers at your command. Take control of your web hosting experience with the power of Cloud VPS through VPS.NET. Eliminate slow content downloads with our Content Delivery Network. Wherever your users may be, they will experience lightning-fast content downloads from hundreds of global servers. Our Content Delivery Network is reliable, scalable, secure, cost effective and easy to use. Your Guide To Basic Server Security: an overview of the techniques and methods you can use to secure your server and help keep it protected from threats. 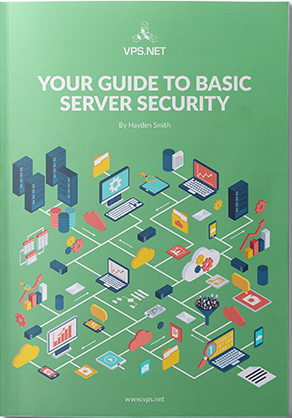 Find out everything you need to know about securing a server, including why you need to secure your server, using a firewall to help secure it, and the importance of using multiple users and access controls in this white paper by entering a few short details below. *NAME: *EMAIL ADDRESS: I would like to subscribe to updates from VPS.net. I understand I can unsubscribe at any time. Thank you! Please check your email for a copy of our whitepaper.